How to calculate differential gear ratio: It's simple! 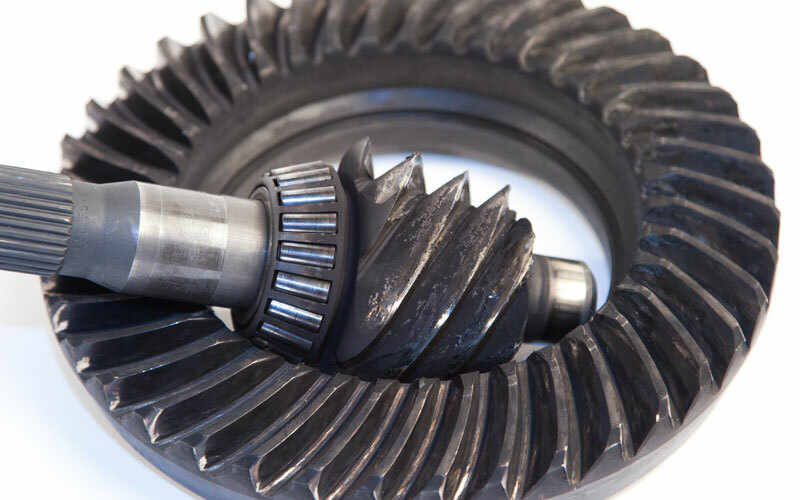 Western Differential has a huge inventory of top quality OEM and aftermarket ring and pinion gear sets. OEM brands include American Axle, Chrysler, Dana Spicer, Ford and GM. Aftermarket brands include G2, Motive Gear, Revolution Gear & Axle, Sierra Gear & Axle and US Gear. We also offer refurbished OEM ring and pinion gear sets. We are currently having closeout deals on New and Used OEM/Aftermarket Ring and Pinions. Give us a call today! Chrysler: AAM 9.25" Chrysler Front, AAM 10.5" Chrysler, AAM 11.5" Chrysler, Chrysler 7.25", Chrysler 8" IFS, Chrysler 8.25" and 8.375", Chrysler 8.75", Chrysler 9.25"
Ford: Ford 7.5", Ford 8", Ford 8.8", Ford 9", Ford 9.75", Ford 10.25" and 10.5"
GM: AAM 11.5" GM, GM 1955 Passenger, GM 1955 Truck, GM Corvette, GM 7.25" IFS, GM 7.5" and 7.625", GM 8", GM 8.2", GM 8.2" B.O.P (Buick/Olds/Pontiac), GM 8.25" IFS, Camaro/G8/GTO, GM 8.5" and 8.625", GM 8.875" 12 Bolt Passenger, GM 8.875" 12 Bolt Truck, GM 9.25" IFS, GM 9.5", GM 10.5"
New Ring and Pinions usually get real hot first use. Each time gears heat up and then cool down after use, they will get less heated. (I.e. Drive to work then park, drive home then park, etc. or 20 to 30 minutes of use then park for +/- 30 minutes). Gears that get to above 180 degrees need to cool, its normal to be around 150-170 degrees. It is highly risky to tow weight or to travel long distances before gears have had time to break-in. The first 1,000 miles are the most important. Break-in should be finished after 1,000 miles. WARNING: Customers who tow and/or travel in the first 1,000 miles; do so at their own risk! We cannot warranty scuffed gears if it happens while towing or traveling. Differentials with new Posi tractions or clutches can snap, pop, or chatter for the first 50 to 100 miles until Posi friction modifiers (Posi additives) has had time to get into all areas to properly lubricate the limited slip parts (i.e. cones or clutches). We recommend additional Posi additive if noise continues after +/- 100 miles and to be serviced every year. We recommend 80-90W mineral oil GL5 or GL6 rated. WARNING: We DO NOT recommend synthetic oil to break-in new gears. Synthetic should be safe to use after 1000 mile break-in with mineral oil. We cannot fully guarantee against pinion seal, axle seal or cover leaks if using synthetic oil. Some gear manufacturers will void warranty if synthetic oil is used.